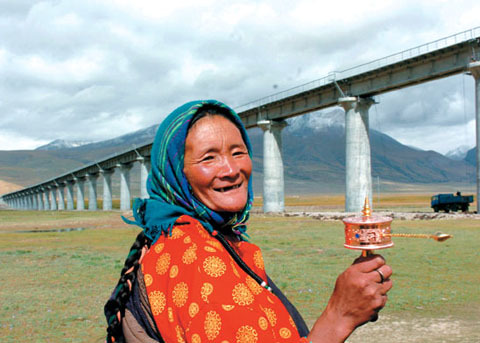 With population of 5,416,021 by 2000, most of the Tibetans live in Tibet Autonomous Region. A few are scattered in Qinghai, Gansu, Sichuan and Yunnan Provinces. Tibetans speak a language belonging to a sub branch of the Tibetan-Burman branch of Sino-Tibetan phylum. There are 3 major local dialects: Weizang, Lang and Amdo. Tibetan script was first created in the early 7th century with four vowels and 30 consonants; it is an alphabetic system of writing. Tibetans take "Zanba" (roasted highland barley flour), mutton and Yak beef as the staple food. Their drinks include Yak butter tea and barley wine. Pronounced as "kha-tag", hada is regarded as an honorable gift of Tibetans, which is a long narrow white scarf made of silk. Through it, the Tibetan people express their best wishes on many occasions like wedding ceremonies, festivals, visiting the seniors and the superiors, and hosting guests. People should lift the hada above their shoulders and bow to the receiver if presenting it to a shrine or a high-rank lama. The hadas embody the purity, loyalty and blessing. Being given a hada, people is supposed to receive it with both hands. When you visit a local Tibetan family, the host may entertain you with their home-made barley wine. Please receive it with both hands. Traditionally before drinking the guests are expected to use the forefinger to dip in the cup and flick the wine in the air three times to show respect to gods of heaven, earth and dragon. Then you should take three cups of wine non-stop or sips three times, get refilled and then bottom up (for light drinkers). Drinking butter tea is a daily must-do for all the Tibetans, which help them to fight against rigidness, enhance the blood circulation. When the guests are offered a cup of butter tea, they are not expected to empty it at one gulp, but leave some in the cup to get more refilled. Once you have enough, please pour the rest of the tea on the ground gently. Please always walk clockwise around the religious shrines, stupas, Mani stones and prayer wheels. However, if you visit a Bon monastery, then walk counterclockwise! The monks take off their shoes upon entering a chamber, while it is fine to the visitors without doing the same thing. Entering a chamber during the chanting session is allowed on condition that there should be no disturbance to the monks. While in a Tibetan monastery, please don’t smoke, drink alcohol or make big noises. Besides, please don’t touch, step over or sit on any religious scripts of any forms. Always ask for permission before taking photos. Don’t do harm to any creatures in this land: yaks, dogs, vultures and sheep. Don’t stepping on the threshold when entering a Tibetan house. The public display of affection is not suggested in this religious area. Tibetans do not believe in burying or cremating dead bodies. The remains of the dead are cut up by funeral priests at dawn to feed vultures, in the belief that these birds take the spirits to heaven. Strangers are forbidden to attend the ceremony.